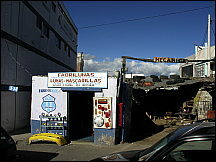 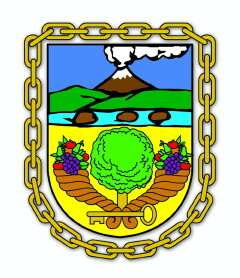 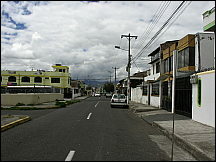 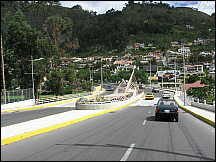 The city is a leading commercial and transportation center on a fertile region near the northern foot of the volcano Tungurahua, which is still active with a major eruption way back in August 2006. 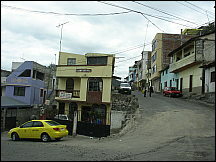 Look at the below pictures of this monster as taken from an Ambato home. 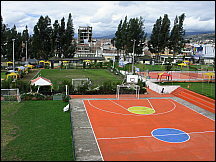 It is towering over the city, ready to crush it. 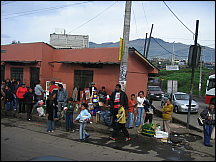 On Mondays the city hosts one of the largest fruits, vegetables, and assorted meats markets in the country. 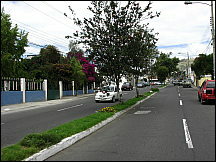 In addition, Ambato casts the famous "Fiesta de las Flores y de las Frutas" (Flowers and Fruits Festival) in February. 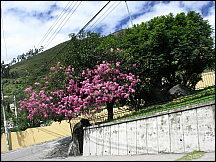 As a way to recover from the tragic earthquake of August 5, 1949, Ambato began its tradition of the Fruits and Flowers Festival. 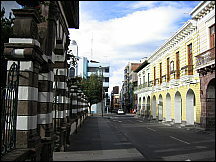 It is now a major tourist attraction held in the city. 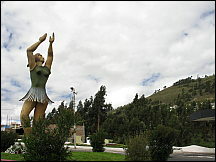 During this time, schools and businesses close for different varieties of parades and shows, and a "Queen of Ambato" is also chosen from representatives of each high school, some government offices, and the police force. 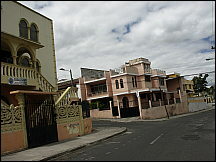 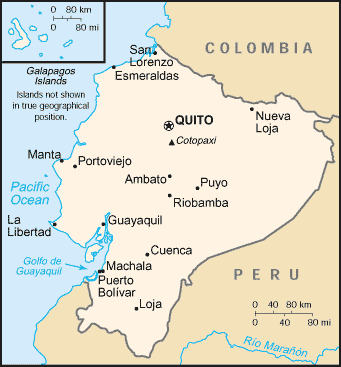 The earthquake of August 5, 1949 destroyed most of the city, leaving few buildings of the colonial era. 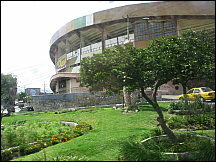 Landmarks include the mausoleum of Juan Montalvo, the estate of Juan León Mera, and the white Ambato Cathedral. 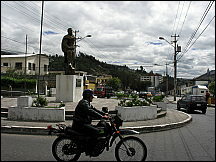 Ambato is also where, on November 12, 1821, Antonio José de Sucre achieved a major victory over the Spanish Royalist Army during the war for independence. 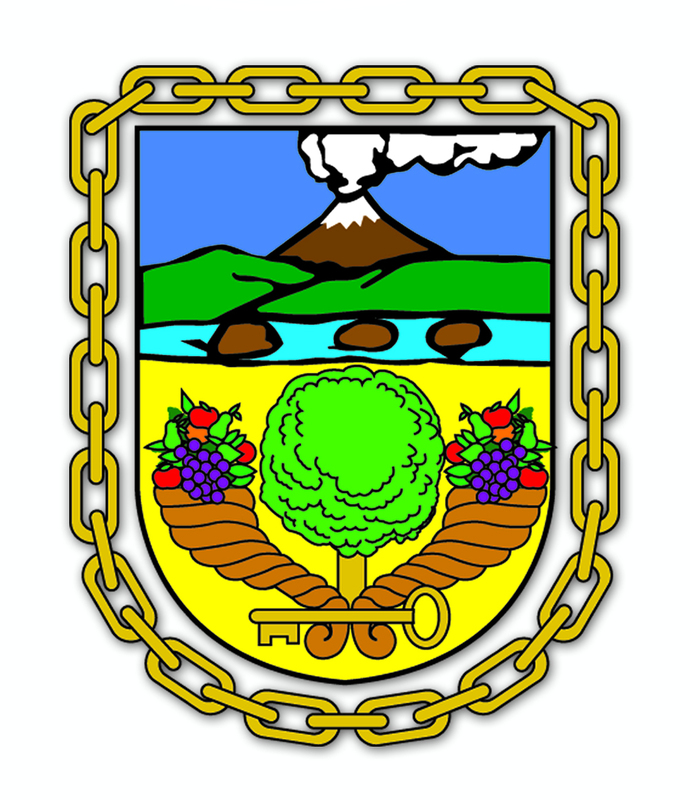 This date is now an official holiday in the city. 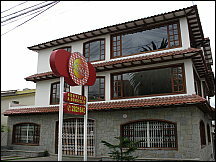 Famous people from Ambato include master painter Aníbal Villacís and professional poker player Carlos Mortensen. 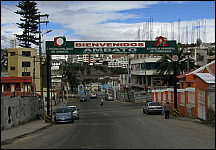 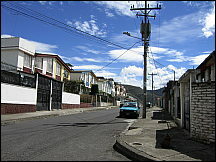 The name Ambato comes from the name of several species of toad (jambato). 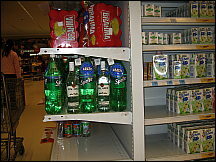 These toads are either endangered or extinct. 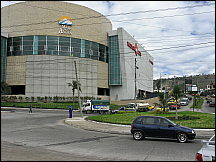 A new mall with a movie theater has recently been built called "El Mall de Los Andes". 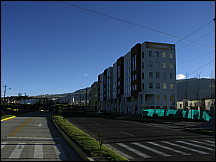 Photos of the mall and the again active volcano are below. 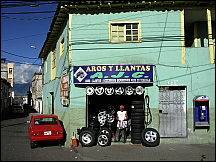 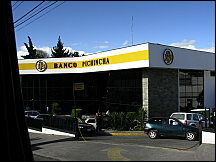 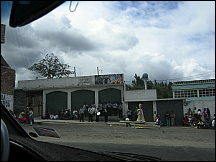 Free pictures of scenes around Ambato, Ecuador. 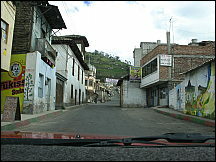 Photos of nearby towns and destinations are separate. 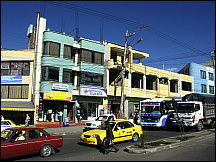 Busy intersections get busier as official and impromptu bus stops crowd in, but a great place to get some food, whether walking or on the bus - in Ambato, Ecuador. 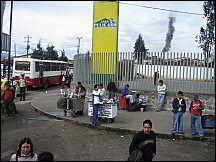 Busy intersection get busier as official and impromptu bus stops crowd in, but a great place to get some food, whether walking or on the bus - in Ambato, Ecuador. 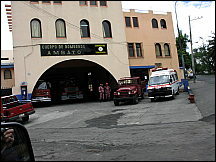 The Iglesia Capilla de la Medalla Milagrosa (Chapel of Miracle medal) is one of many churches in Ambato, Ecuador. 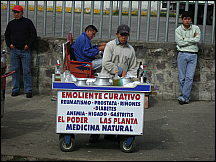 One wonders if they attract the earthquakes and volcanic eruptions that periodically destroy the city. 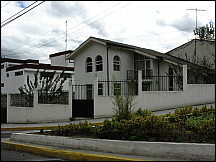 The Iglesia Providentia is one of many churches in Ambato, Ecuador. 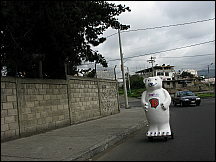 One wonders if they attract the earthquakes and volcanic eruptions that periodically destroy the city. 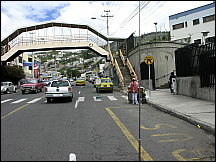 There is plenty of traffic, even with heavy use of private buses and public transit in Ambato, Ecuador. 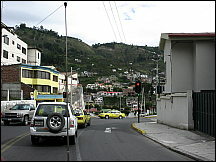 Traffic signals are obeyed more than many other places. 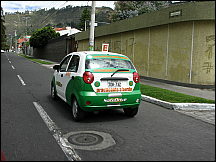 Auto driving school car in Ambato. 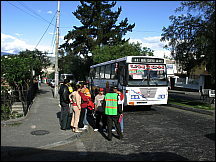 There is plenty of traffic, even with heavy use of private buses and public transit in Ambato, Ecuador. 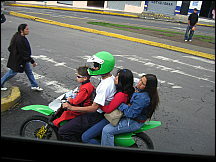 This person is lucky to learn in an area with little traffic congestion. 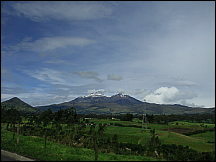 Snow capped mountains and live volcanoes surround Ambato, Ecuador. 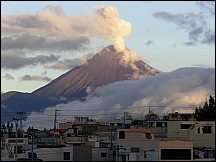 Here Tungurahua shows its power with a (without phot0 magnification) from a Ambato home's deck. 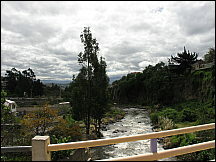 Snow capped mountains and live volcanoes surround Ambato, Ecuador. 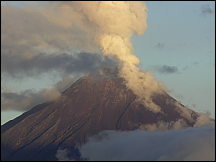 Here Tungurahua shows its power with a slight phot magnification from a Ambato home's deck. 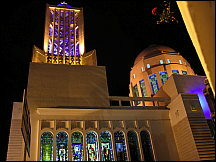 The beautiful modern cathedral of Ambato, Ecuador as seen at night. 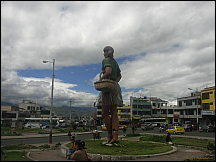 Large, colorful statues at traffic circles greet visitors to Ambato, Ecuador.